Colin Cook, MS 2016 Caltech graduate, was on a mission to find a better alternative to the available invasive and painful treatments for diabetic retinopathy. It appears that Cook’s groundbreaking contact lens therapy has taken wearable medical devices to a whole new level. In fact, his extraordinary invention, accomplished along with researchers at the new Medical Engineering Lab of Caltech, has the potential of preventing the leading cause of blindness! According to the American Diabetes Association, each year the United States records approximately a quarter of a million deaths from diabetes; while additional diabetic diagnoses are growing at the rate of 1.5 million annually. The World Health Organization reported that as of 2016, the worldwide number of diabetic adults had almost quadrupled from 1980.The leading cause of vision-loss worldwide is diabetic retinopathy, an advanced-stage effect of diabetes suffered by 33% of this population. Known as creeping blindness, diabetic retinopathy is a direct result of damage to tiny blood vessels; reducing blood flow to the retina’s nerve cells, and it is the precursor to nerve death. When our bodies respond by trying to grow new retinal blood vessels they are unfortunately poorly manifested, and their bleeding (macular edema) not only obscures your vision, but also damages the retina (which the body repairs with scar tissue instead of new light-sensing cells). Retinopathy involves the blood vessels located in the retina (the light-sensitive tissue located at the back of your eye). Specifically, the retinal damage evolves over time from an insufficient supply of oxygen. While available treatments have been based upon destroying or hampering the creation of blood cells which demand more oxygen, these methods have offered no path to preventing onset nor an actual cure. The laser treatment burns away peripheral cells of the retina (leaving more focus on the vision cells at the retina’s center). The injection of medication into the eyeball curtails new blood vessel growth; hence lowering the level of oxygen needs. Unfortunately, both of these treatments involve painful and invasive methods. Because patients considering therapy tend to experience high anxiety, they may possibly refrain from as many treatments as might best handle their conditions. This abstract published by the NCBI (National Center for Biotechnology Information) is a revealing example of patient preferences for treatment choice as well as the frequency they are agreeable with undergoing. The eye’s rod cell photoreceptors provide vision during low-light settings. Over the past couple of decades, the hypothesis has been that damage from diabetic retinopathy primarily occurs at night (when the rod cells crank up their oxygen requirements). Similar to laser treatments, Cook’s lenses also decrease the metabolic demands of the retina – but with a different approach. The glow lenses are calculated to lower night-time demand by providing the rod cells with the least possible amount of light while the patient is asleep. The technology was borrowed from the glowing markers on the faces of wristwatches. Illumination for the contact lens is supplied by tiny vials full of tritium (which emit electrons as it decays). These electrons are transformed into light by way of a phosphorescent coating, to assure that constant light is produced through the lifetime of the lens. Though light therapy has been tested before (lighted sleep masks, etc.) patients were unable to tolerate the shining light while they slept. The glow lens vials form a circle large enough to be outside the patient’s view during daytime or lighted conditions, while in the dark (when the pupil expands) the faint glow from these vials is enough to illuminate the retina. The glow lens, while worn overnight, is fashioned to interrupt the process which would normally destroy the cells of the retina. 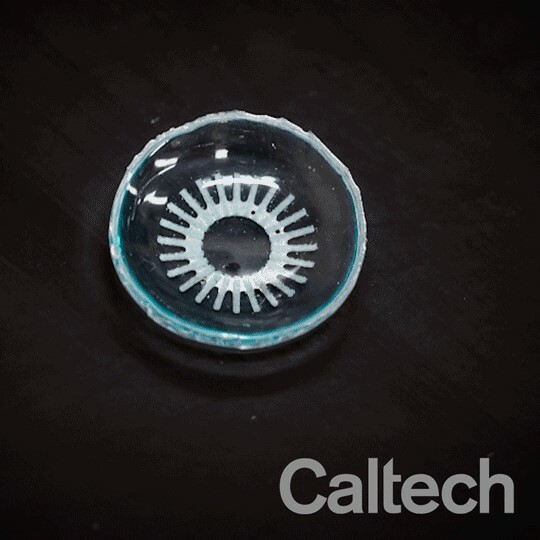 University of Southern California’s Mark Humayun’s lab is currently collaborating with Cook’s team by conducting early testing of the new lenses. Findings show that when these lenses are worn in the dark, the rod cell activity (and their demand for oxygen) is significantly decreased by up to 90%. Cook and his researchers plan to continue to explore the possibility that the glowing lenses will prevent diabetic retinopathy. Once these tests are complete, the FDA permits will be sought to conduct clinical trials. The team’s project was recognized as the Top Medical Technology at a recent TigerLaunch entrepreneurship competition hosted by Princeton University; and received promising accolades from venture capitalists and encouragement from audience members as well. The Orion Vision Group makes it their mission to stay at the cutting edge of new medical lens technology. Please feel free to contact us with questions or concerns about your choices and decisions surrounding ocular improvement for your patients.